Or not. A few pictures of our journey. One time (three years ago), we almost missed a flight because I got bored watching delays and wandered off in search of coffee and a magazine. 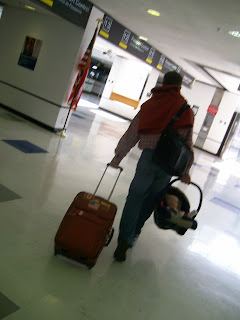 I looked up to see Justin running toward me yelling, "We have to be on the plane NOW!" We had to run. It felt like a movie. He was scarred. I laughed about it, which may have added to the trouble. Yesterday I asked how much longer until he forgets that experience. In other words, when will the freak out end? (We regularly get to gates and find we're the only ones waiting for our flight. There's early and there's obnoxiously early). He told me it might take another five to ten flights before it'd be okay for me to find a bathroom and get a Starbucks before waiting through the security lines. Anyway, until then: this is my view. Justin's behind. 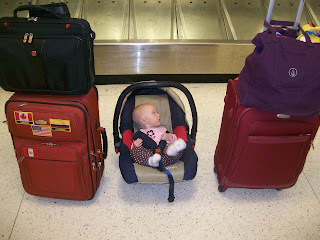 And here is our littlest carry on. Cutest too. Claire was great on the flights. Snoozed, ate and giggled. Even after last week's monster headache obtaining paperwork, the DAS clerk still questioned our half sheet of paper saying Claire was okay to leave the country. I started slapping down all the paperwork we had until the clerk said, "Tranquilo, tranquilo" and waved us through. Someday I'm going to print up a hundred pages of notarized nonsense and shove that across a desk. Gak. It's okay, it's okay. See? 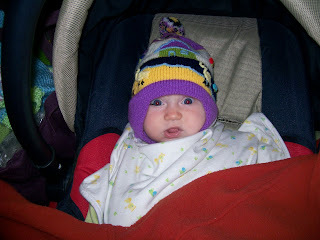 Here she is, okay and ready to brave the bitter cold.